New Mexico ranks number 45 in U.S. population density and that means there is lots of wildlife! 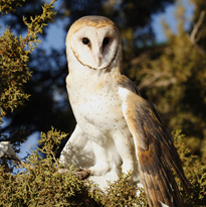 Santa Feans deeply care about preserving and restoring wildlife and one of the many outstanding organizations doing such work is the New Mexico Wildlife Center (NMWC) located in nearby Espanola. NMWC works year-round to conserve and restore native wildlife and their habitats through education, public awareness, strategic partnerships and wildlife rehabilitation. NMWC is like the Medicaid for Wildlife that receives up to 1,000 injured or orphaned wild animals a year from around the state. The hospital side of NMWC is the only permitted wildlife hospital in New Mexico and they are the happy recipients of mule deer from Chama, Mississippi kites from Carlsbad, Mexican spotted owls from Deming, mountain lions from Abiquiu and on and on. Over 75 volunteers (and more gladly accepted!) operate like a tag team for injured wildlife from around the state. When a volunteer in Silver City receives a Harris’s Hawk with a broken wing, they deliver it directly or from city-to-city until it arrives the next day to NMWC’s hospital. When the hawk is well enough and staff has tested it to make sure it can navigate its native environment and capture food, NMWC devises a plan for release. This plan will take into consideration: the health of the bird, its normal habitat, its origin, whether or not it migrates, if it is an adult, does it already have a mate in its original territory, what the weather is likely to be at the time of release, what time of day should the animal be released, what are the likely predators for this animal and what is the carrying capacity for this species in the release zone. Finally, a release is executed. It is a wonderful event! As a non-profit organization, New Mexico Wildlife Center is dependent upon volunteers. One such volunteer is City Different’s own Bonnie McGowan who has volunteered for years at NMWC on a weekly basis. Please consider visiting Santa Fe and the New Mexico Wildlife Center. Volunteer needs include cleaning mews and enclosures, feeding the animals, special projects, transporting wildlife, website maintenance, weekend docent, grounds and facilities projects, office assistance, educators/educator handlers, and fundraising/public outreach events.